BREAD BAKING OVEN: Specially designed traveling type Direct/Indirect oil fired ovens along with 6" Pitch slat type conveyor, suitable for baking Bread, Buns, Rusk, Fruit Bread, and Bakery Biscuits, etc. With the help of our skilled workforce, we are able to manufacture and supply supreme quality Baking Oven. The offered baking oven is used for baking cake, biscuit, bread, etc. this product is made by premium quality raw material in compliance with the international quality standards. 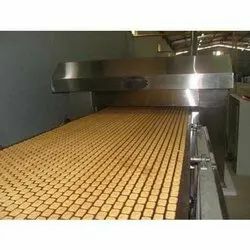 Spectoms offer a range of gas fired/electrically heated biscuit ovens in capacities ranging from 2 TPD to 5 TPD for 800 mm to 1000 mm biscuit/cookie lines. Our experts have designed Biscuit Oven for the commercial purpose. These ovens are perfect in size and demanded by all users for measuring of the temperature. Perfectly made these ovens are easy to install, best in quality and show resistance to damage by any factor. All ovens are superior in working and easy to obtain from us.